New R2R FKT: Tim Freriks, 2h39m38s, 10/1/2017. Previous R2R FKT: Jim Walmsley, 2h46m08s, 10/4/2016. Previous R2R FKT: Rob Krar, 2h51m28s, 5/25/2012. NEW R2R2R FKT: Jim Walmsley, 5h55m20s, 10/4/2016. Previous R2R2R FKT: Rob Krar, 6h21m47s, 5/11/2013. Previous R2R2R: Dakota Jones, 6h53m38s, 11/5/2011. New R2R FKT (women): Alicia Vargo, 3h19m23s, 11/8/2017. Previous R2R (women): Bethany Lewis, 3h47m, 11/6/2011. New R2R2R FKT (women): Cat Bradley, 7h52m20s, 11/15/2017. prevoius R2R2R (women): Bethany Lewis, 8h15m51s, 11/6/2011. R2R2R2R2R: Jim Nelson, 22h48m, 11/6/1999. R2R2R2R2R2R2R2R (really! ): Jason Vaughan, 68h10m, 5/4-7/2013. The Rim-to-Rim (R2R), R2R2R, and R2R2R2R2R (!) have been huge classics for many years. A speed record here really counts as a world-class performance, as many of the best mountain runners have tested their mettle in the Canyon. 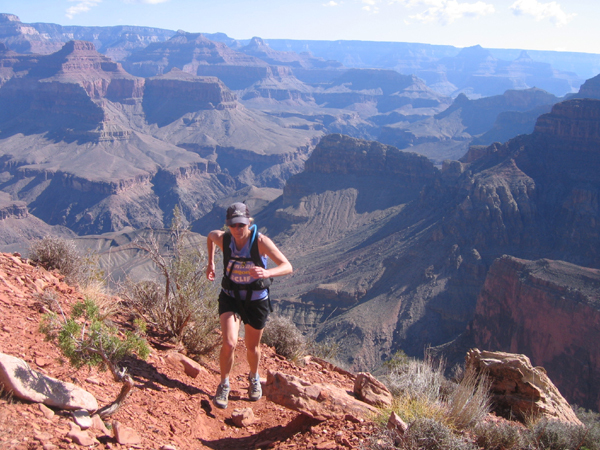 The fastest times are typically set by running the North and South Kaibab Trails. 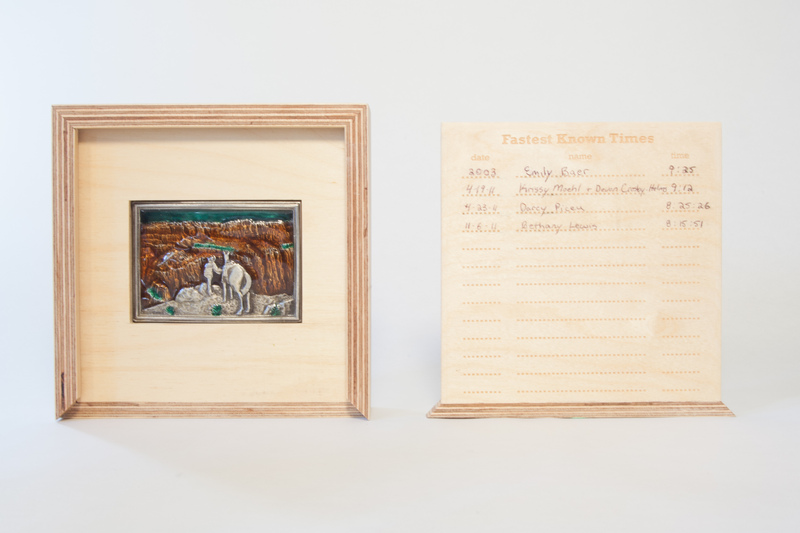 Rim-to-Rim: As best I can tell the record was held by Allyn Cureton, 3h06m47s set way back on 10/4/1981, starting on the North Rim, until it was broken by just 37 seconds by Jared Scott on May 27, 2011 (see below). That record lasted just less than a year, and was broken by Rob Krar with an excellent 2h51m28s on 5/25/2012 (see below). Jason Wolfe (2h58m30s) and Jared Scott (3h3m10s) also broke the old record that day. A detailed report with splits is on Wolfe's blog. Jim Walmsley smashed the previous R2R FKT on 10/4/2016, running an amazing 2h46m08s in the harder South-to-North direction, while on his way to a stunning new R2R2R record (see below)! A year later, Walmsley aided 2017 Transvulcania champion Tim Freriks on a new R2R (north to south) FKT of 2h39m38s on October 1, 2017, as reported on Walmsley's Twitter feed and Freriks' Instagram. Trail Runner Magazine interviewed Freriks after the run. Rim-to-Rim-to-Rim: Cureton also held the R2R2R record for 25 years at 7h51m23s, set in an actual race on 11/9/1981 (S to N to S Kaibab trails). Races have long been banned in the National Parks. The record was finally bested on 11/10/2006 by Kyle Skaggs, 7h37m. Kyle had to run a little extra due to a bridge being out. A year later (11/10/2007) Dave Mackey ran 6h59m56s. Mackey reported being held up for several minutes on his ascent back up the South Kaibab by a mule train. Mackey's record held for about 4 years before being broken by Dakota Jones who ran 6h53m38s on Nov. 5, 2011. Jones reported on his blog as follows: "...Mackey was held up for several minutes during his record run on the way back up the South Rim by a mule train. A similar thing happened to me, except that instead of a mule train I was held up by being astoundingly tired. I ran hard, but never felt like I was approaching my comfort zone until the final climb, when I entered the suffer zone and then fell into the abyss of despair. From the few reports I have read as well as my own two experiences running the Double Crossing, two facts seems to be permanent for all runners: 1.) Nobody goes into it rested. Everybody just runs the Grand Canyon as a training run, or in between races, or when getting back into shape. Nobody trains and tapers specifically for the Grand Canyon. 2.) You're going to blow up on the ascent back to the South Rim. Stop deluding yourself - it's going to happen. You can't avoid it. However, I will stick my neck out and say that a fit and rested runner who finds the Canyon in good condition could significantly lower the time. My prediction is that within five years the men's record will be under six hours. Go ahead - call me out on that. It will happen." Jones also reported the following splits: River(49m), North Rim(3h22m), River(5h12m), South Rim(6h53m38s). Anton Krupicka failed to beat Jones' time on April 20, 2013, 6h59m24s, just 32s faster than Mackey's 2007 time. Then, on 5/11/2013, Rob Krar brought the FKT all the way down to 6h21m47s, as reported below. Jim Walmsley crushed the R2R2R FKT on 10/4/2016, 5h55m20s! Walmsley set the R2R record on the way, despite going in the harder South-to-North direction (see above). Walmsley fulfilled Jones' 2011 sub-6-hours-within-5-years prediction just a month before the deadline! Trail Runner Magazine has a good first article on the run. 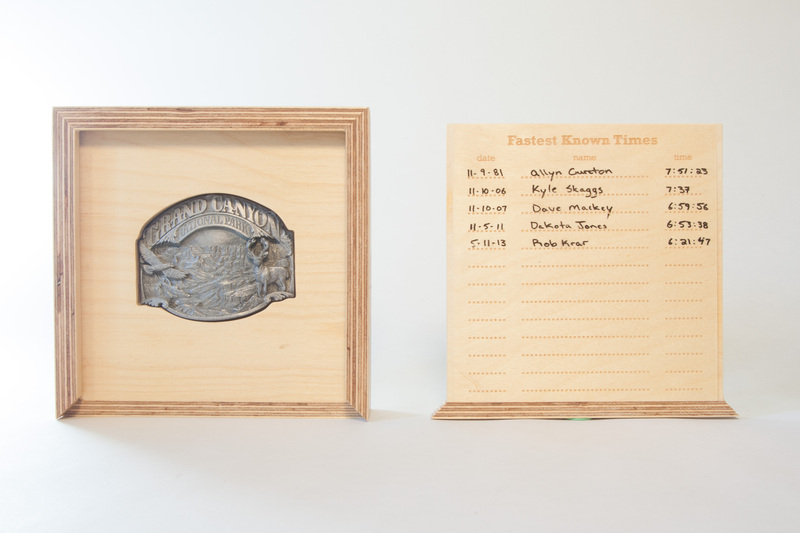 Rickey Gates and partner Elizabeth Thorp have created a series of custom belt buckles commemorating some of the most iconic and hotly contested FKT routes! The R2R2R certainly qualifies. Each buckle is awarded to the FKT holder, and passed on when that FKT is superseded. Currently this buckle is held by Rob Krar (6h21m47s, 2012) for the men and Bethany Lewis (8h15m51s, 2011) for the women. As far as I can tell, prior to 2011 the fastest time by a woman was Emily Baer's 9h25m in 2003 or so. However, 2011 was a banner year for women's speed records on the R2R2R. On April 19, Krissy Moehl and Devon Crosby-Helms ran the route in 9h12m, as reported below and on Moehl's blog and Crosby-Helms' blog. This record stood just 4 days, and was broken on April 23 by Darcy Piceu, who ran 8h25m26s, as reported below (with splits). Finally, on Nov. 6 Bethany Lewis lowered the bar still further, running 8h15m51s, with an unusual North Rim start. This was reported on irunfar. Lewis' split of 3h47m at the South Rim was the women's R2R FKT as well. Both these times were finally broken in 2017, the R2R by Alicia Vargo (3h19m23s, 11/8/2017) and the R2R2R by Cat Bradley (7h52m20s, 11/15/2017). Bradley's detailed report on her R2R2R effort is here. She was paced the entire distance by Jim Walmsley and Nico Barraza. Rim-to-Rim-to-Rim-to-Rim-to-Rim: The double R2R2R is rarely done. 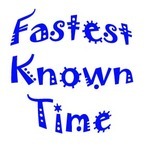 The fastest is by Jim Nelson, 22h48m on 11/6/1999. The following additional quad crossing information is courtesy of Davy Crockett: Previously, Wally Shiel established the quad record on 10/4/1987, with a time of 24h45m. Others who have completed quad crossings are Dana Miller (1993), Susan Gimbel (1994), Davy Crockett (2006), and Jason Vaughn (2013) who did 43h31m on his way to the first ever triple R2R2R (see below). Rim-to-Rim-to-Rim - Bass Trails: On October 18, 2014, Buzz Burrell, Charles Corfield and Peter Bakwin set out to complete the first known R2R2R using the South and North Bass trails. These trails are about 20 miles northwest (down river) from the Kaibab trails, and have a remarkably similar profile and distance (43 miles total) to the Kaibab trails. The biggest differences are that the Bass trails are much less developed, narrower and far rougher than the "corridor" trails, and that there is no bridge at the Bass crossing! And, of course, the Bass trails see probably 0.1% of the traffic of the Kaibab trails. Burrell, Corfield and Bakwin started at the South Bass TH at 6:07a.m., ran down to the river, swam across in wetsuits with their gear in dry bags, then trundled up towards the North Rim. At the climb through the Redwall layer, seeing that they were moving too slowly to make the rim and get back to the river before dark, Burrell and Corfield turned around while Bakwin continued to the top, which he reached at 2:11p.m., and then ran back down, meeting his partners on the south side of the river just before dark. The trio reached the south TH at 10:22p.m., so Bakwin's R2R2R time was 16h15m. Burrell's account of their adventure is on the Ultimate Direction blog, and includes photos and a comparison of the Kaibab and Bass trail profiles. Dana Miller did the quad in 1994, not 1993 (I was with him). He was shooting for a sub-24, but got very nauseous on the last crossing, puked his guts out all the way up the SK to the finish. He was the first one to do it, though. I am wondering if there is regular route for a complete traverse of the Tonto? Little Colorado to S. Bass? Also, any times recorded or other info? I don't know, but Scott Jurek did it last year in around 32 hours. You can check his Facebook for more info. Please report back if you discover anything interesting! You might also check with Davy Crockett who seems to know a lot about the canyon. To make it official we are excited to state our intention to run the womens FKT on the R2R2R. Devon Crosby-Helms and Krissy Moehl intend to start at 6am on Tuesday April 19, 2011 on the S. Kaibab trail and do a complete out and back. (S. Kaibab & N. Kaibab). We will time ourselves, take photos and have witnesses at start and finish. Finally we will post our results here after the run. Wish us a speedy and safe journey! On April 15-16, 2011 I ran a solo, self-supported Traverse of the Tonto Trail from South Bass Canyon to Cottonwood Creek in 27:56:51, about 77 miles. I think the complete traverse of the Tonto should be South Bass to Red Canyon (Hance Rapids). That can be debated because trails continue on either end, but on the east it is no longer called the Tonto and on the west it requires an out-and-back. I didn't quite make it all the way to Red Canyon, ten miles short. Scott Jurek and Joe Grant ran it April 2011 in 32 hours. That time may have been trailhead to trailhead (South Bass to New Hance). Just a quick post to confirm that Krissy and I did indeed run the R2R2R yesterday, April 19th, 2011 in 9:12:29. We will be posting splits, blogs and tons of photos and videos as soon as we have them assembled. We are super stoked! Though we've second hand got reports today that Darcy Africa broke our record, I wanted to make sure I posted up our blogs with all the photos, videos and splits to follow through. It was an epic journey for both Krissy and I! Here's a link to Dan's public Facebook page on the run. On April 24th, 2011, Jennifer Roach did not come close to breaking Darcy's impressive speed record, but she did complete her 10th R2R2R. Perhaps this is a record for the most R2R2Rs by a woman, or perhaps anyone? 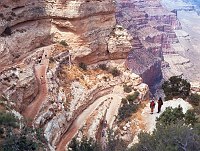 Also, 8 of her 10 RRRs have been her 50-mile version, which is down the Bright Angel, east on the Tonto to the South Kaibab, down the lower South Kaibab, up and down the North Kaibab, then back up the complete Bright Angel. I've had the pleasure of going with her on three of these excursions, including this most recent one. I'll be posting photos on my Facebook page. The North to South R2R record was broken today by Jason Wolfe and Jared Scott. They clocked a 3:06:10, as reported by my friend Caleb Schiff. More details will be forthcoming, I'm sure. So just to be clear. Jared Scott ran a 3:06:10. Jason Wolfe was feeling strong and making up time on his way up S. Kaibab but got stuck behind a mule train. I believe he would have had it too if not for the asses. His final time was 3:13 and change. db tonight at 5 PM to celebrate.